Unlike many vehicles on the market, Acura has decided to change the game by offering its models with packages rather than trims. The 2019 Acura MDX is the perfect example of this. Here's a look at the MDX trims and packages to determine the differences. 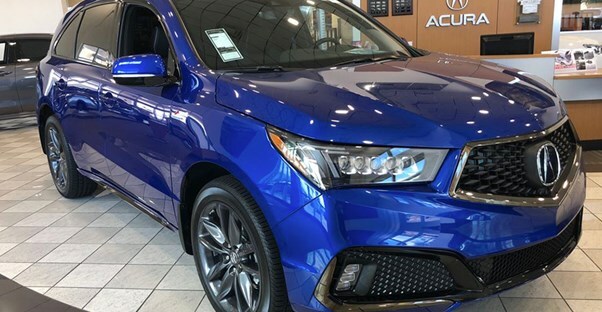 Like with most smaller vehicles, the 2019 Acura MDX comes with two drive options: front-wheel-drive and all-wheel-drive. Both options come with a 3.5-liter direct-injection V6 engine that gets 290 horsepower and 267 lb-ft of torque. The front-wheel-drive option is the least inexpensive at $44,300. However, you can have more control by paying $46,300 and getting all-wheel-drive. The third drivetrain option (and second engine choice) is the Sport Hybrid Super Handling All-Wheel Drive. This vehicle comes with a 3.0-liter port-injected V6 engine that gets 221 hp and 289 lb-ft of torque. One thing you should know is that when choosing the hybrid engine option, buyers are required to add the Technology Package. Additionally, the Entertainment Package is not available as an option. The base level Sport Hybrid Super Handling AWD model comes out to $52,800. The combined fuel economy rating for the hybrid model is 27 MPG compared to 23 MPG on the front-wheel-drive gas model and 22 MPG for the gasoline AWD. The Technology Package adds features to upgrade the convenience of the vehicle. Some of the changes include GPS-linked climate control, voice recognition, and also navigation display. The navigation system offers a 3D view with real-time traffic updates and rerouting if the traffic is too bad. Overall, the Technology Package is an additional $5,000. The Advance Package can be added on for an additional $6,750. That number is a bit deceptive, however, as choosing this package requires buys to also include the Technology Package. That brings the total additional cost of both packages to $11,750. A gas FWD MDX comes out to an MSRP of $56,050 while the gas AWD would be an MSRP of $58,050. On the exterior, the Advance Package adds LED fog lights and roof rails for extra storage. For the interior, it upgrades the seating to perforated Milano premium leather with contrast piping and stitching. The seats are also heated and ventilated, so you stay comfortable no matter the season. To add to the comfort, drivers have access to a heated steering wheel, as well. For safety, the Advance Package adds a Surround-View Camera System, which allows you to see your 2019 Acura MDX from all angles. The third package is the Entertainment Package, but it can also be a little confusing. To choose this option, you must pair it with one of the previous packages: the Technology Package or the Advance Package. The Entertainment Package is not an option with the Sport Hybrid engine. The lowest possible price for a gas FWD MDX with an added Entertainment Package would be $51,300. On the gas AWD model, that would come out to $53,300. The most significant change is the addition of more speakers. When purchased with the Tech Package, your MDX will have 11 speakers. If you choose the Advance Package, the Acura MDX will have 12 total speakers. Some smaller changes include a full VGA screen, wireless headphones, rear-door sliding sunshades, and HDMI compatibility also. Drivers have an upgraded entertainment system along with the features from the two previous options. The fourth and final package addition is completely new for 2019. Like the Advance Package, it requires buyers to also opt for the Technology Package as well as the gasoline AWD drivetrain. The A-Spec itself is an additional $3,500, but choosing it will set you back $10,500 total with the pairing requirements. That means your 2019 Acura MDX would cost approximately $54,800. The perks of this package are mainly cosmetic in nature, allowing your MDX to stand out with 20-in. shark gray split five-spoke wheel, exclusive front and rear bumpers, dual exhaust, piano black rear spoiler, chrome accenting on the tailgate and headlights, and A-Spec branding badges on the vehicle, steering wheel, and paddle shifters. There is also a unique red instrument panel illumination.